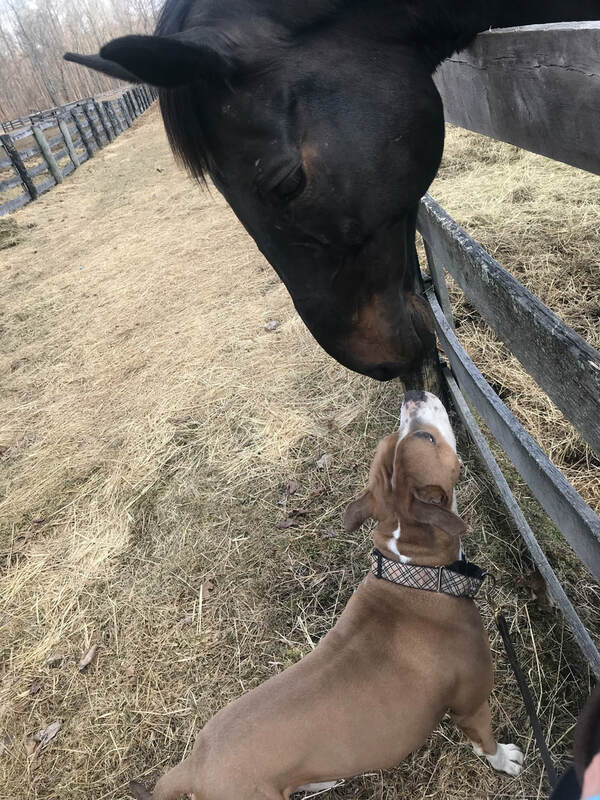 Ralphie greeting his biggest equine fan, Emerson! Ralphie using that paw like a hand! Once outside & his brain is fully awake, he's ready for play! When Ralph first arrived to us he would have chosen to jump on his handler, grab shoes and pretty much anything hanging within his reach! It was pretty cute and entertaining and hard not to laugh.. We've managed to teach him better ways to express his playfulness and he is a great listener! The more you engage Ralphie the more he offers! To Ralphie its all a game and the more interaction the better. He soaks up praise and happily works for more! Ralph is an OUTSTANDING, beautiful boy in so many ways.. he is smart, agile, mellow, attentive and cooperative! He easily follows direction from a light hearted happy leader.... if ignored he will find ways to catch your attention while entertaining himself This boy is a true partner .. we find he attends to his handlers tone and vibe.. you are chilling.. Ralph is chilling.. you bust a play move and Ralphie is right there with you! We think he could work for a living.. many ideas come to mind! Ralphie has become a BFF play-pal of big and tall horse Emerson! Emerson gets excited when he sees Ralphie approach his paddock.. so much so he sends away his pasture mates so he can have Ralphie all to himself!! We think aside from Ralphie's sweet playful vibe he has much in common with Emerson very first dog pal, the magnificent Bruno.. Bruno changed Emersons life.. helped him come out of his shell.. Ralphie is the perfect play buddy for Emerson now.. Ralph offers play bows to Emerson and hops up on the fence boards to share breath ( the equine greeting ritual) Its such a delight to watch Emerson elegantly trot down the fence line alongside Ralphie!! We will get some video of that up soon!